Navin Field, Detroit, Tuesday, June 14, 1932, Jimmie Foxx crosses the plate in the top of the 5th inning after hitting his first of two HRs on the day, a 3 run blast off Vic Sorrell with fellow future HOFers Al Simmons and Mickey Cochrane on base, and the A’s were out to an early 5-0 lead on the Tigers as dejected catcher Ray Hayworth looks on. The umpire is Roy Van Graflan. Jimmie Foxx, of course, needs no introduction – almost midway through a prolific Hall Of Fame career, Foxx would probably have his best offensive season in 1932, at 58(a career high, just short of Ruth)/169/.364, also leading the league in slugging (no surprise), runs, and total bases. He garnered AL MVP honors, and by today’s rules (3.1 PA x team games played) he would have also had the AL Triple Crown, but Dale Alexander of Boston hit .367 in 454 plate appearances, and was recognized as the batting champ. 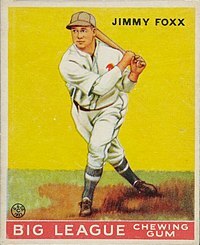 Foxx would get the Triple Crown in earnest in 1933. Foxx already had two rings with the A’s in 1929 and 1930, but would never win another, nor even appear in another post-season, moving on to the Red Sox, Cubs and Phillies in his career. Ray Hayworth was the starting backstop for the Tigers in 1932 and 1933, and a defensive specialist – at the game above, he was in the midst of an AL record for most consecutive chances by a catcher without an error at 439 (100 games), from 9/3/21 to 8/29/32 (a record later broken by Yogi Berra). Interestingly enough, the streak would end against the A’s (although at Shibe Park), and dubiously at that – as Jimmie Foxx was at bat, a dropped third strike allowing Foxx to Reach and Al Simmons to score. Today, that would be considered either a passed ball or a wild pitch, not an error, and a contemporary box score of the game does not show an error for Hayworth. Ultimately, it probably wouldn’t have secured the record for Ray – Yogi was able to reach 148 errorless games in 1959, and the current record is an astounding 253 games by Cleveland’s Mike Redmond, set in 2010. Unfortunately, Hayworth didn’t have the power the Tigers were looking for to stay a regular, and when Detroit traded for Mickey Cochrane after the 1933 campaign, he was relegated to a backup role; but with Cochrane’s help, he made it to the World Series the next two seasons, winning his only ring in 1935, although he did not see any action in the ’35 classic. The A’s eventually took the Tigers 10-5 on that Tuesday in June of 1932. The win would put the second place A’s 2.5 games up on the third place Tigers, but no one was catching the Yankees that year. 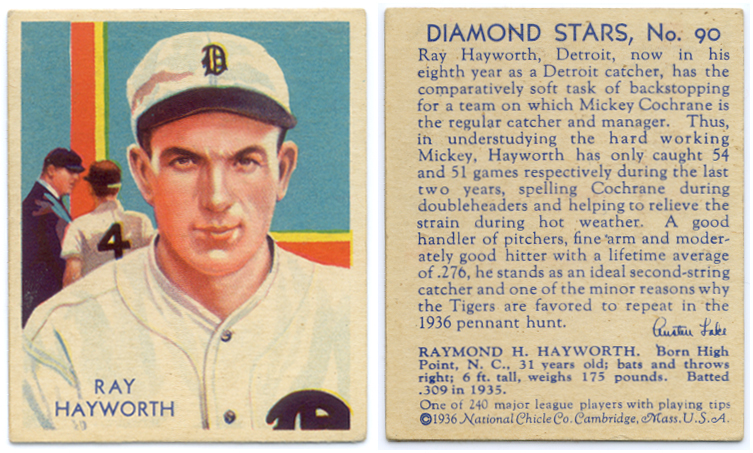 Ray Hayworth had an interesting footnote to his years as a Tiger – in his rookie season he played alongside Ty Cobb in his final campaign. This bit of serendipity, and his eventual longevity, would result in an honor that he could not possibly have envisioned happening way back in 1932 – he was chosen to throw out the ceremonial first pitch for the final game at Tiger Stadium, on September 27, 1999, at 95 years of age, in effect representing virtually an entire century of Tigers baseball.